Try our Natural Quartz Spheres Satisfaction Guarantee - compare our prices and our superior quality. Click on any natural quartz crystal sphere image below to enlarge it. This colorless sphere of transparent natural quartz crystal has some planes and veil-like inclusions within it. It measures 1.6 inches in diameter. This colorless sphere of transparent natural quartz crystal has some planes and veil-like inclusions within it. 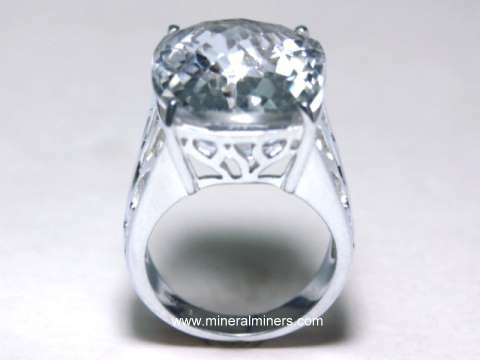 It measures 1.75 inches in diameter. This 1.9 inch diameter colorless sphere of transparent natural quartz crystal has some planes and veil-like inclusions within it. This 2 inch diameter sphere of natural quartz crystal is transparent with light veils and planes inside. This genuine quartz crystal ball was sawn and polished from a natural quartz crystal that was mined in Minas Gerais, Brazil. This 2.3 inch diameter sphere of natural quartz crystal is transparent with light veils and planes inside. This colorless quartz crystal ball was sawn and polished from a natural quartz crystal that was mined in Minas Gerais, Brazil. This colorless quartz crystal egg is 2.7 inches tall. This egg has very good transparency with some light veils and planes inside. This egg was handcrafted from a natural quartz crystal that was mined in Minas Gerais, Brazil. 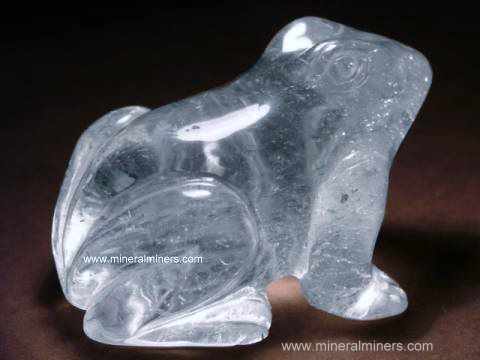 This 2.7 inch tall egg of natural quartz crystal is transparent with light veils and planes inside. This egg was sawn and polished from a natural quartz crystal that was mined in Minas Gerais, Brazil. This 2.8 inch tall egg of natural quartz crystal is semi-transparent with light brown natural color and with golden rutile inside. This egg was sawn and polished from a natural quartz crystal that was mined in Bahia, Brazil. 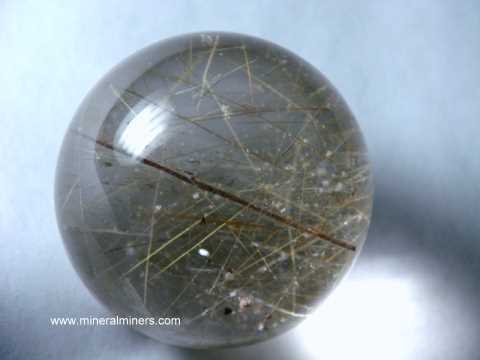 See an opposite side view of this quartz egg with gold rutile. This 2.8 inch diameter sphere of natural quartz crystal has good transparency with some veils and planes inside. This colorless quartz crystal ball was sawn and polished from a natural quartz crystal that was found in Minas Gerais, Brazil. This 3.7 inch diameter sphere of natural colorless quartz crystal is mostly cloudy and semi-transparent. In certain positions you can just faintly see all the way through the sphere. This 3.2 inch diameter sphere of natural quartz crystal has good transparency with some colorful rainbow reflections inside and with some veils and planes. This colorless quartz crystal ball was sawn and polished from a natural quartz crystal that was found in Minas Gerais, Brazil. This 3.8 inch diameter sphere of natural quartz crystal has good transparency with some colorful rainbow reflections inside and with veils and planes. See an additional photo of this genuine quartz crystal sphere. This colorless quartz crystal ball was sawn and polished from a natural quartz crystal that was found in Minas Gerais, Brazil. This 4 inch diameter sphere of natural quartz crystal has good transparency with veils and planes inside. This colorless quartz crystal ball was sawn and polished from a natural quartz crystal that was found in Minas Gerais, Brazil. This 4.7 inch diameter sphere of natural quartz crystal has very good transparency with some veils and planes inside. This colorless quartz crystal ball was sawn and polished from a natural quartz crystal that was found by local miners in Minas Gerais, Brazil. 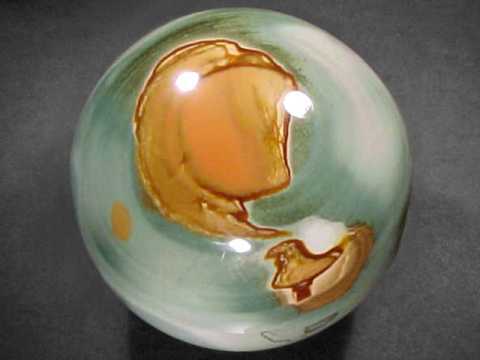 See also an opposite side view of this unique crystal ball. This 5.1 inch diameter sphere of natural quartz crystal has good transparency with some veils and planes inside. This colorless quartz crystal ball was sawn and polished from a natural quartz crystal that was found by local miners in Minas Gerais, Brazil. 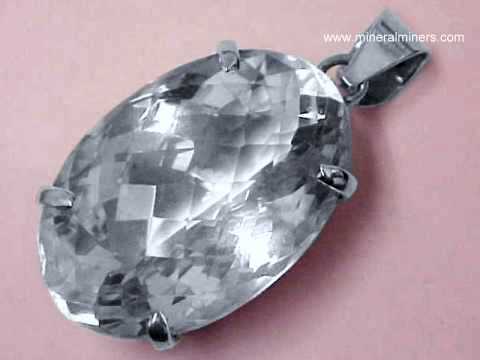 See a side view of this genuine quartz crystal ball. See also an opposite side view of this authentic crystal ball. This 2.4 inch diameter sphere of natural lemurian quartz crystal has good transparency with some colorful rainbow reflections inside. This natural quartz crystal ball was sawn & polished in 2005 from a natural quartz crystal that was discovered at a particular mine in Brazil that is very famous as the original source of the unusual natural quartz crystals known as lemurian seed crystals. 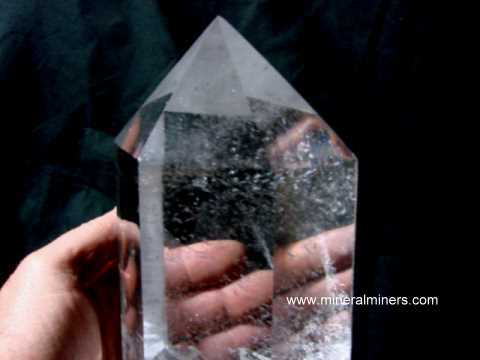 This original Lemurian quartz crystal mine closed permanently a year later. This 3.3 inch diameter sphere of natural lemurian quartz crystal is mostly transparent with several very beautiful rainbow reflections inside! This natural quartz crystal ball was sawn & polished in 2005 from a natural quartz crystal that was discovered at a particular mine in Brazil that is very famous as the original source of the unusual natural quartz crystals known as lemurian seed crystals. 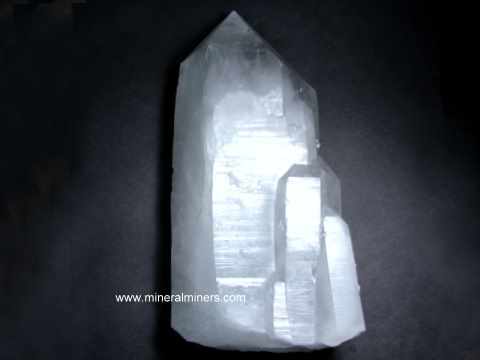 This original Lemurian quartz crystal mine closed permanently a year later. This 3.7 inch diameter sphere of natural lemurian quartz crystal is mostly transparent with several beautiful rainbow reflections inside! This natural quartz crystal ball was sawn & polished in 2005 from a natural quartz crystal that was discovered at a particular mine in Brazil that is very famous as the original source of the unusual natural quartz crystals known as lemurian seed crystals. 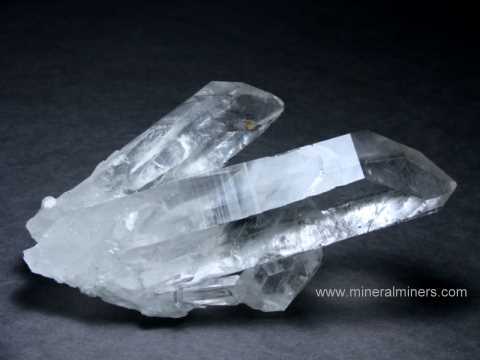 This original Lemurian quartz crystal mine closed permanently a year later. This 3.6 inch diameter sphere of natural lemurian quartz crystal has very good transparency with very beautiful rainbow reflections inside. This natural quartz crystal ball was sawn & polished in 2005 from a natural quartz crystal that was discovered at a particular mine in Brazil that is very famous as the original source of the unusual natural quartz crystals known as lemurian seed crystals. 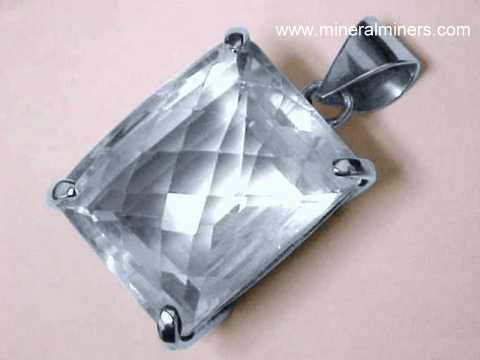 This original Lemurian quartz crystal mine closed permanently a year later. See an opposite side view of this rare quality lemurian quartz crystal sphere. This 3.5 inch diameter sphere of natural lemurian quartz crystal has very rare transparency with some planes inside. This natural quartz crystal ball was sawn & polished in 2005 from a natural quartz crystal that was discovered at a particular mine in Brazil that is very famous as the original source of the unusual natural quartz crystals known as lemurian seed crystals. 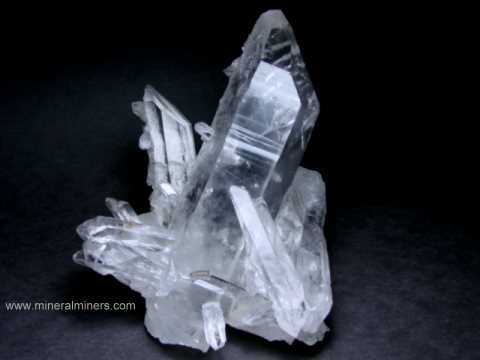 This original Lemurian quartz crystal mine closed permanently a year later. This 4.2 inch diameter sphere of natural lemurian quartz crystal has superb transparency with a huge flawless area inside and some planes with amazing rainbow reflections! 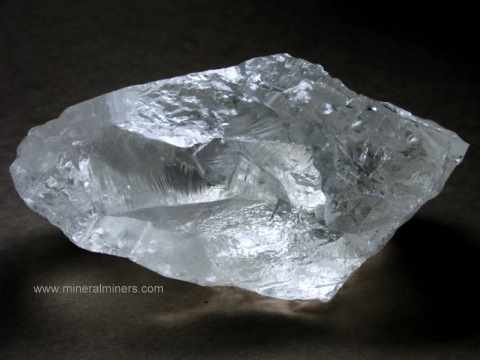 See a side view showing the huge clear area in this rare quality lemurian quartz crystal sphere. This natural quartz crystal ball was sawn & polished in 2005 from a natural quartz crystal that was discovered at a particular mine in Brazil that is very famous as the original source of the unusual natural quartz crystals known as lemurian seed crystals. 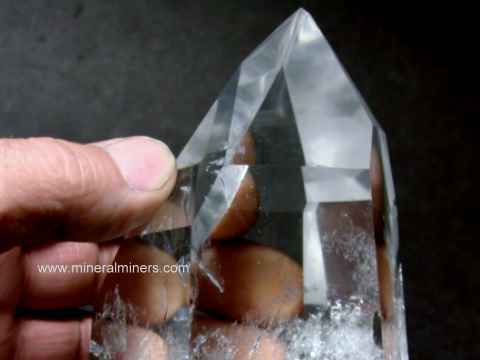 This original Lemurian quartz crystal mine closed permanently a year later. This 4.6 inch diameter sphere of natural lemurian quartz crystal has very rare transparency with some amazing internal rainbow reflections inside. This natural quartz crystal ball was sawn & polished in 2005 from a natural quartz crystal that was discovered at a particular mine in Brazil that is very famous as the original source of the unusual natural quartz crystals known as lemurian seed crystals. This original Lemurian quartz crystal mine closed permanently a year later. This 4.8 inch diameter sphere of natural lemurian quartz crystal has very rare transparency with a large internally flawless area inside weighing over 2 pounds and some beautiful internal rainbow reflections. This natural quartz crystal ball was sawn & polished in 2005 from a natural quartz crystal that was discovered at a particular mine in Brazil that is very famous as the original source of the unusual natural quartz crystals known as lemurian seed crystals. 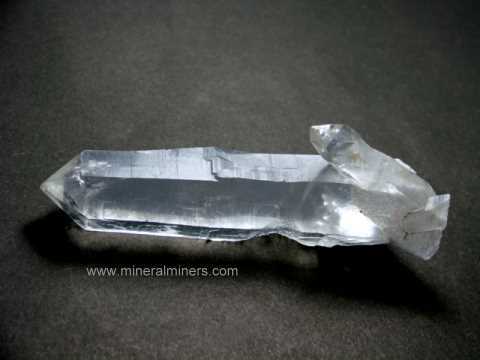 This original Lemurian quartz crystal mine closed permanently a year later. See another view of this lemurian quartz crystal ball. See also an additional view of this lemurian quartz crystal ball. This 6.2 inch diameter sphere of natural lemurian quartz crystal has good transparency with some very beautiful rainbow reflections inside! This natural quartz crystal ball was sawn & polished in 2005 from a natural quartz crystal that was discovered at a particular mine in Brazil that is very famous as the original source of the unusual natural quartz crystals known as lemurian seed crystals. 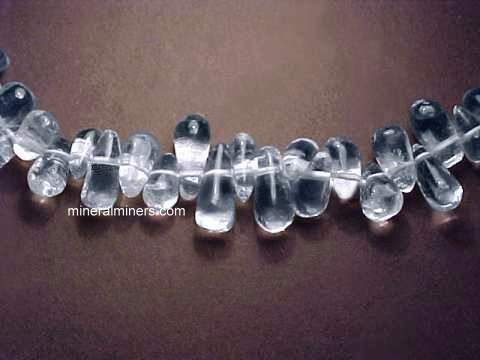 This original Lemurian quartz crystal mine closed permanently a year later. This 9.2 pound sphere of natural quartz crystal is colorless with some rainbow reflections inside. In some positions you can faintly see all the way through this sphere, and in others you can easily see all the way through all 6.25 inches. See another view of this lemurian quartz crystal ball. 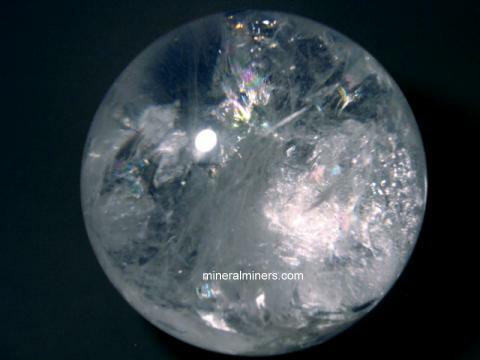 See an additional view of this lemurian quartz crystal ball. This amazing rock crystal ball looks wonderful on a light box! See also another photo of this genuine lemurian quartz crystal sphere. This 4.1 inch diameter sphere of natural quartz crystal is mostly cloudy with a few black tourmaline crystals visible passing throught the white quartz! This unique sphere is transparent to a depth of about one inch. This natural quartz sphere was sawn and polished from a natural quartz crystal that was mined in Minas Gerais, Brazil. This unique sphere of natural quartz crystal is colorless with multi-color phantom layers inside. The phantom layers have chlorite clay minerals in natural color hues of white, pink, gray and tan. See an opposite side view of this genuine chlorite in quartz sphere. The quartz is semi-transparent to transparent. See an image showing the bottom of this chlorite phantom layers in quartz sphere. See also an image of this chlorite phantom sphere laying on its side. This unique sphere of natural quartz crystal is colorless with multiple natural multi-color phantom layers inside. The phantom layers have chlorite clay minerals in natural color hues of white, pink, green and tan. 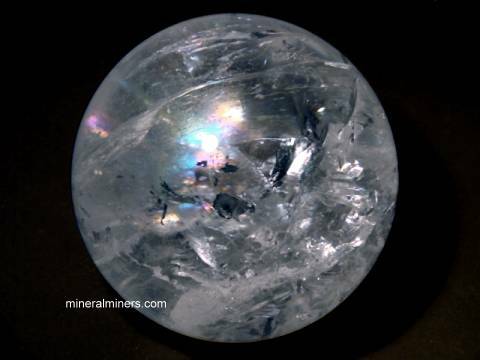 See also a back-lit view of this genuine phantom quartz sphere. The quartz is semi-transparent. This rare quartz crystal ball is semi-transparent to transparent with hundreds of long slender black tourmaline crystals passing through the quartz! Some areas of this sphere are cloudy, and some areas are transparent. See a back-side image of this quartz with black tourmaline sphere. The photo at left shows a close-up, see also a full view of this quartz with black tourmaline sphere. This rare collector sphere is semi-transparent to transparent with dozens of black tourmaline crystals passing through the quartz! Most of the tourmalines pass all the way thru the sphere. See an opposite side view of this quartz with black tourmaline sphere. See also a back-lit view of this quartz with tourmaline sphere. This 4.2 inch diameter sphere of natural quartz crystal has good transparency on one side with some veils inside along with a nice internal rainbow reflection, and it becomes cloudy towards the opposite side. This rare collector sphere is semi-transparent to transparent with dozens of black tourmaline crystals passing through the quartz. See an opposite side view of this quartz with black tourmaline sphere. See also a back-lit view of this quartz with tourmaline sphere. 152 pound Quartz Crystal Sphere! This 18.5 inch diameter sphere of natural elestial quartz crystal weighs 310 pounds! You can see into this genuine quartz crystal ball's interior from a minimum of about 1 inch deep up to about 8 inches deep maximum visibility, with an average visibility depth of about 4-5 inches. There are many planes and veils within this giant crystal ball, and there also are several rainbow reflections inside it. See another view of this giant quartz sphere. This natural quartz crystal sphere also has a few small natural orange-red hematite inclusions. This amazing quartz crystal ball looks wonderful on a light box! 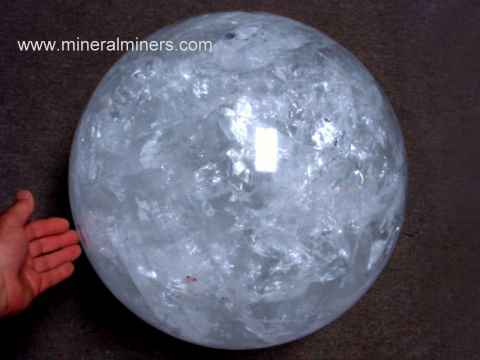 See a back-lit view of this gigantic quartz crystal ball. 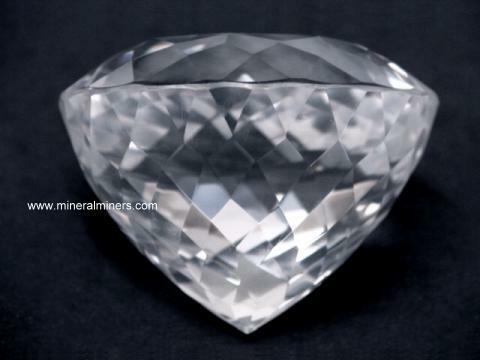 We are offering this large decorator sphere of natural quartz crystal (rock crystal) at a special offer below wholesale discounted price of $295/kg = $41565. This 2.5 inch diameter sphere of natural quartz crystal is transparent with light veils, planes and other inclusions inside. This colorless quartz crystal ball was sawn and polished from a natural quartz crystal that was found in Minas Gerais, Brazil. and then sawn & polished by hand into a genuine quartz crystal ball. 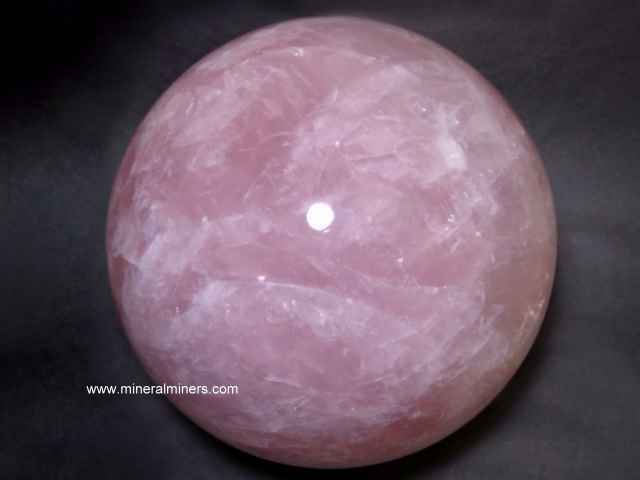 We have collectable mineral spheres available in many other natural quartz varieties. Our amethyst spheres were handcrafted from natural color purple amethyst crystals that were mined in Brazil, and our citrine spheres were handcrafted from natural color citrine crystals. See also our page displaying lemurian quartz spheres. 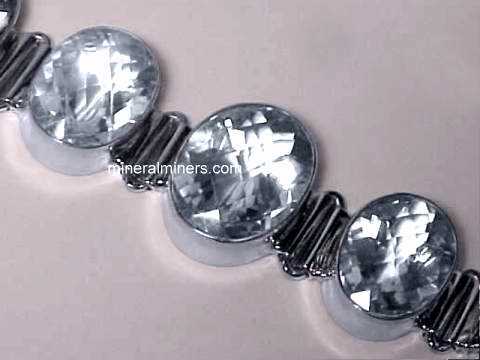 See also our genuine rutilated quartz spheres page, and our pages for natural quartz crystal balls, and our quartz page displaying unpolished (naturally terminated) quartz crystals. 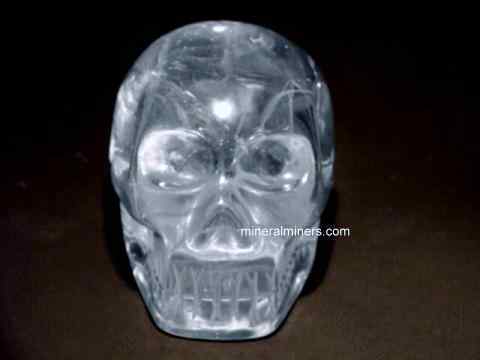 See our selection of genuine crystal skulls! We specialize in Large Quartz Crystals, Large Quartz Clusters and Rare Collector Quality Quartz Crystals! 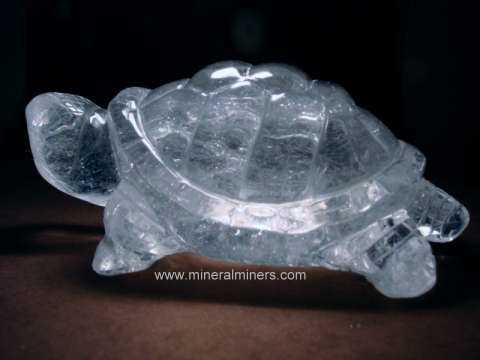 We have a huge inventory of natural quartz crystal products including polished quartz crystals and quartz crystal carvings. 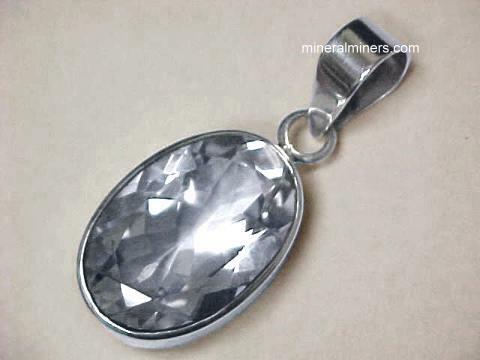 We also have natural quartz crystal gemstones set into handcrafted jewelry designs in necklaces, pendants, earrings, quartz crystal rings, and fine quality quartz crystal bracelets. Would you like us to inform you when we add more natural quartz crystal spheres (spheres of natural rock crystal quartz, also known as crystal balls) on this page? We literally have tons of natural quartz crystal spheres in stock at our mineral warehouses, so be sure to let us know if you have a special request for a quartz crystal sphere. Please contact our webmaster or our 'site' geologist with any questions or comments.